Jane Borden — bona fide Southerner, sorority sister, and debutante — graduates from the University of North Carolina at Chapel Hill and moves up to “northern territory,” aka New York City. The move in itself is not unusual. “Coveys of college grads recycle themselves in overpriced adapted two-bedrooms,” Borden explains. “We treat our time in New York like a rite of passage, a year spent in the woods.” But Borden ends up staying well beyond the expected year or two. She becomes, in effect, a New Yorker. 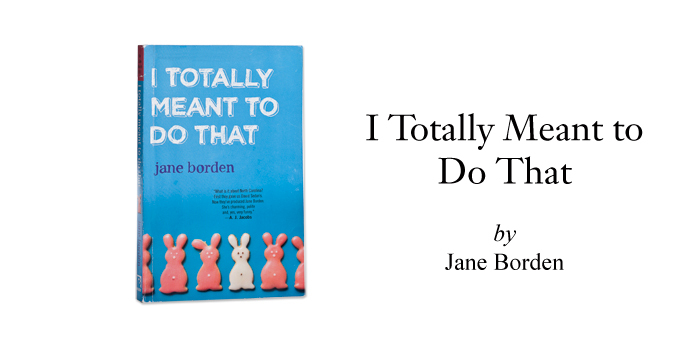 I Totally Meant to Do That is a collection of hilarious essays documenting her transformation. As the years pass, the decision of where to permanently settle becomes increasingly pressing. Should she stay in New York City, living a life of freedom, excitement, and grunge, or return home to a life of beauty, family, and claustrophobia? As readers, we travel Borden’s journey with her, and when we put aside the book at last, it is with a feeling of pleasant exhaustion, as if we, too, have bounced like a Ping-Pong ball between two opposed worlds — and have somehow found common ground. Broadway Paperbacks. 2011, 240 pages, paperback, $14.